Abracadabra Leaflet Distribution offers cost-effective GPS tracked leaflet distribution Reading RG1 – RG2. Whether you are a new business or you have a long established brand name, we can offer you a quality professional service which includes geotargeting to ensure you are delivering to the right target audience. In addition to this we can offer you a customised design, print and distribution package through our highly experienced graphic design team; you even get a discount on our distribution services if you have your leaflets printed and delivered by us. Our distributions are completely accountable and reliable as all our deliveries are GPS tracked by highly accurate software. We are also a proud member of the Leaflet Distribution Organisation(LDO), which will give you added peace of mind. But don’t just take our word for it – see what our clients have to say about us by visiting our testimonials page! Reasons To Choose Abracadabra Leaflet Distribution? 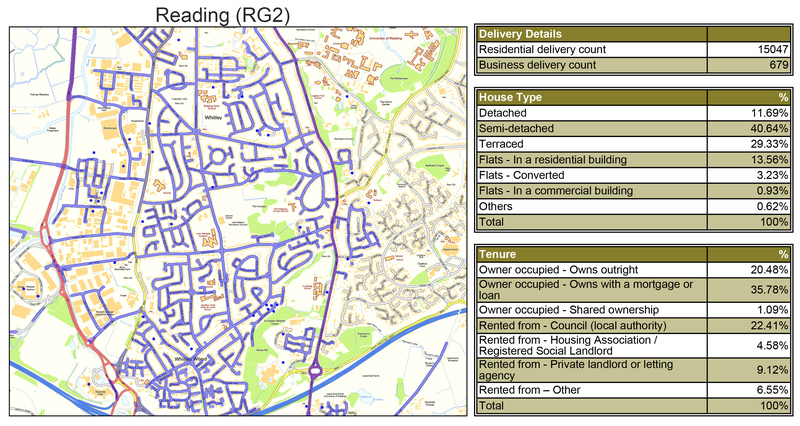 FREE report on the completion of GPS tracked leaflet delivery. You can view the exact route the flyer delivery person took to deliver your leaflets, as seen in the above image. FREE expert advice is provided on the best possible way to plan your promotion. Save with our special design, print and distribution packages. FREE region specific demographic information for all the postcodes within an area, as shown in the example image below. The above information is a combined data for postcode RG2 including Whitley, Shinfield and Arborfield. Reading has grown extensively since the Middle Ages, gradually reaching out to link smaller village communities together into a vibrant metropolitan area that still contains a number of distinct urban villages. Abracadabra Leaflet Distribution Reading can cover the town and small villages including Aborfield, Burghfield Common, Caversham, Emmer Green, Bracknell, Mortimer, Purley, Pangbourne, Sonning, Shinfield, Tilehurst, Thatcham, Theale, Twford, Ruscombe, Hurst, Wargrave, Newbury, Newtown, Southcote, Calcot, Whitley, Woodley, Earley, Lower Earley, Spencers Wood and Three Mile Cross.